Ice fishing enthusiasts who have a heater in their fishhouse need to beware of carbon monoxide (CO) poisoning. A carbon monoxide detector should be standard equipment in every fishhouse with a heater, according to Goodhue County educator Chuck Schwartau of the University of Minnesota Extension Service. 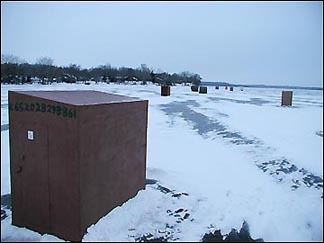 ÒA heater that consumes the oxygen in a house can turn the pleasure of ice fishing into tragedy,Ó Schwartau points out. Carbon monoxide is an odorless gas that tends to sneak up on its victims, says Schwartau. Victims tend to get drowsy and may attribute that to the comfortable warmth of the house and the slow pace of waiting for fish to bite. In reality, the drowsiness may be the first sign of carbon monoxide poisoning. A headache may also be a symptom. Schwartau lists the symptoms of CO poisoning in order of increasing severity. They begin with headache, shortness of breath, dizziness, fatigue, mental confusion and difficulty thinking, and loss of fine hand-eye coordination. These symptoms may be followed by nausea and vomiting, rapid heart rate, hallucinations, and an inability to execute voluntary movements accurately. The most severe symptoms progress to collapse, lowered body temperature (hypothermia), coma, convulsions, seriously low blood pressure, cardiac and respiratory failure, and death. ÒBecause of the wide range of symptoms, prevention is a better option than diagnosis by symptom,Ó says Schwartau. Schwartau says a simple, battery-operated CO detector in a fishhouse could be the difference between a successful fishing trip and a family tragedy. He suggests getting one as a post-holiday gift for an ice fishing enthusiast. Hardware stores carry the detectors. ÒIf you feel some of the symptoms and have any suspicion of CO poisoning, the first action to take is to get into fresh air,Ó says Schwartau. ÒThen see a doctor immediately for treatment.Ó Minneapolis.